I really spent some time thinking about this one - Misik and Hsin-Chen especially have a real advantage here - they come from design traditions dating back thousands of years! My country, Canada, is a babe in the woods - surely the youngest country in the group, having been a country for just 100 years (well, we celebrated our centennial when I was in high school, so if my math is correct, we are closing in on 150 years now!). This doesn't leave much time to develop textile or design traditions. We do have a Canadian tartan - the "maple leaf plaid" to the left, created just a few years before our centennial celebrations - but I couldn't see making an art quilt out of it (though I recall my mother loved it and made me a skirt out of it). So I wracked my brain - would I have to go back in history and visit the ancestors in Scotland and Ireland to use their imagery? But Canada is the homeland of some very creative indigenous peoples - the first nations tribes, the Inuit, and - from the Pacific northwest coast just off British Columbia - the Haida nation. 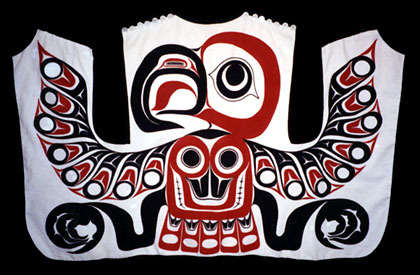 Luckily for me, the Canadian Museum of Civilization, just minutes from where I live in Ottawa, has beautiful Haida artwork by renowned artists like Bill Reid and Robert Davidson, and some ancient artifacts like this garment depicting an eagle and the carved ceremonial dish below. 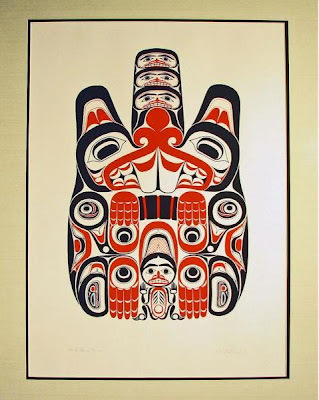 I also discovered a beautiful book Haida Art by George F MacDonald, where I learned the history of this fascinating people. 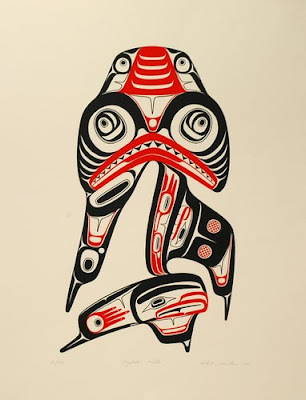 For centuries the Haida have lived on the Queen Charlotte Islands, a remote archipelago off the northwest coast of North America (yes, there are even some in southeast Alaska). Art, myth and ceremony were an integral part of their lives, and over time they developed a rich, distinctive and powerful style of sculpture and painting. So what can I do to put a contemporary spin on this traditional artform? I think it will be fun to design a piece using the motifs, shapes and colours of Haida prints, depicting something very contemporary. The "big reveal" is just one week away, so be sure to visit again on April 26 to see what everyone came up with. What beautiful, artistic designs! 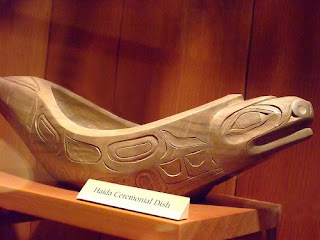 The Haida are evidently a very creative people, with a rich background and I can't wait to see how you interpret their style.